None of us gets there alone. Not one among us is self-made. We are people, craving human connection and influenced in individualized and complex forms. We are taught what to do and what not to do by the people in our lives. We are shaped and molded by the people we spend the most time with. We learn how to mimic and become the best form of those around us, or they offer us text book examples of what we don’t ever want to become ourselves. Name those people. Is that who you aspire to become? If so, then you are in good shape. If not, what can you do to turn that theory in your favor – to step outside of the law of averages to overcome the boundary lines that have been drawn for you? I will tell you what I do – I seek out an expert and imitate their systems. A Virtual Mentor. When things get bad, or when inspiration strikes, I seek out expert advice. I read their books, blogs, and listen to their podcasts; tweak their systems to meld into my own. What I have discovered about myself is that I can do anything and accomplish great things when I have a system. Trying to lose weight? Get a system. Clean and organize the house? Get a system. Putting your finances in order? Get a system! Over the course of the last 20 years I have done them all and I am happy to say that as long as I find a system that works for me, and I work that system, great strides have been met, and most importantly, maintained. 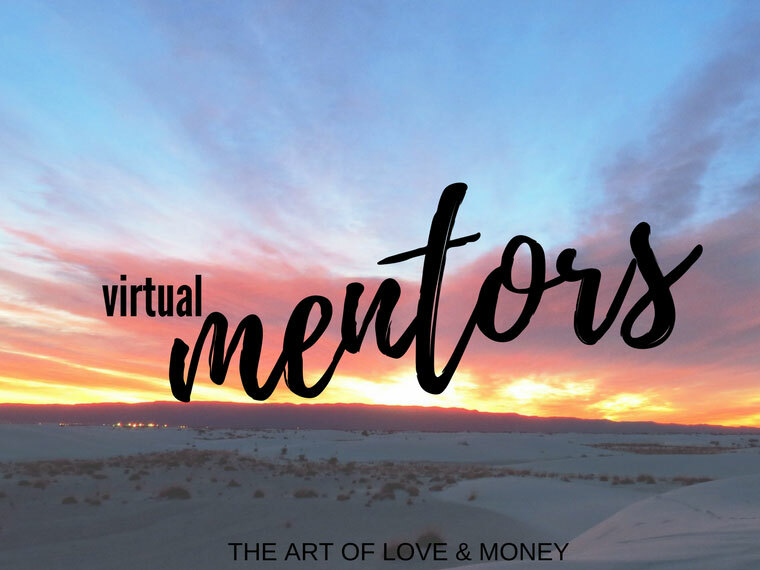 I am going to do you a favor and introduce you to my favorite virtual mentors. Dave Ramsey has a cult-like following, and he covers all of the basics. I listened to his 3 hour podcast daily way back before podcasts were cool and it really helped me to define where my contentment lay, to cure my stuff-itis and my house fever. It helped me to follow his step by step plan and reprogram my consumer-minded thinking. In addition to the Dave Ramsey Show, we have the Financial Peace Home Study kit. My husband and I have been through the series 4 times. All four times have benefited us, each time going a deeper layer to the next level. I have also used the ELPs, the Endorsed Local Providers for our investing needs. EntreLeadership is the first podcast that exposed me to high-level leaders and opened a huge door of experts to me. I listened to that weekly, even though I don’t own a business and never intended to start one. I still took valuable insights from each episode. Ramsey Solutions are rapidly expanding check out their website for a full range of podcasts, books, and courses that may be of interest to you. Thomas Stanley has sadly passed away, but his research into the everyday millionaire in the United States was fascinating and had me riveted from the moment I picked it up. It was the first book of its kind that I had read. Statistical and data driven, laced with personal stories and examples of millionaires in their own words. Example after example of how the people who look rich, ain’t rich. Rife with friendly, likeable, honest men and women of character and hard work, going against social norms to the beat of their own drum. I also read The Millionaire Mind, The Millionaire Women Next Door, and his blog. His foundation continues on and his work lives on through his partner and his foundation. David Bach wrote the Smart Finish Rich Series. Smart Couples Finish Rich is the first book of his that I read. He has also been a hot topic in financial articles, blogs and television interviews as well as a renowned speaker. He was the first one to teach me how to set up goals for how to pay yourself first, not only by automatically setting up retirement investments and automatic bill paying, but really, first determining what it is you live for, and funding those goals and dreams before your money flows through the checking account leaving your wish lists behind and unfulfilled. His dream basket savings accounts changed our entire financial philosophy and transformed everything. Instead of just saving to save, we were saving to fund for our dream honeymoon of ten days in the Jamaican sun – and that was something we could easily exchange for overspending in other areas. In addition to the dream basket savings accounts, we still use the financial file box system we set up 10+ years ago. It is a relief to have a spot to file all of our important papers as they come in the mail slot. I used to save all of my papers, but they were in cardboard paper file boxes – haphazardly – until that box got full and I started a new one. Shamefully, I had a few boxes piled high in the corner. When I needed something I had to search through all of those boxes frantically until I could locate the items. I realize I could have bought a file cabinet at any time, but the truth is, that without a system, I didn’t get around to it. Get his instructions from the back of his books or find it here. Farnoosh Torabi hosts the podcast So Money and has written three books You’re So Money, Psych Yourself Rich, and When She Makes More. She also writes a finance column for O Magazine, and I love me some Oprah! I love the wide ranging variety of authors and topics Farnoosh hosts on her show. Her longevity in the world of financial journalism brings heavy-hitting big names to the table like old friends. Topics of personal finance, women breadwinners, businesses and non-profits, and she answers Q&A style on Ask Farnoosh Fridays. She keeps it fresh with different series such as a special theme weeks for Millionaire Next Door types and interviewing family members of successful thought leaders, including her own parents and Ramit Sethi, his mom and his sister. Chalene Johnson gave me a new passion for living life according to my goals. She has a podcasts that I adore – The Chalene Show and Build Your Tribe. Twenty minutes of easy listening, inspiring, bite size chunks of how to have a better outcome on life and increase your productivity. The author of PUSH goals and co-founder of Courageous Confidence Club and Smart Success Academy she has helped me take my dream goals and put them into action, step by step, 90 days at a time. Whereas David Bach showed me how to fund my bucket savings account, Chalene Johnson has helped me to live out my bucket list. In addition to stirring a voice inside of me to write down this system as well as inspire me to begin looking keeping my eye out for a side hustle income. Although I had been listening to Entreleadership Podcast for some time prior to finding Chalene Johnson, I had only been thinking in terms of help for my husband’s side business or how to be a leader within the parameters of my 9-5 status. I had no interest in running my own company. But as I listened, a side hustle became very interesting to me, especially as I realized my income was limited by the salary set by my employers. and the hours in a day, week, or year. Ramit Sethi has totally blown my mind with his psychology of business and money. I have only just begun to scratch the surface of the potential return on investments from his programs, but it isn’t from lack of resources. His site, I Will Teach You To Be Rich is full of free information that is far better than what his competitors charge for. Ramit authored his first e-book for $4.95, apologetically, and has 10X’ed his results ever since. His material has helped me to overcome timidness in my ability to earn more money, has opened my mind to the possibilities and philosophy of a rich life. Not just a rich bank account – which takes an achingly long time to do with a fixed employee income and no side hustle! To date, I have purchased one course, How To Find Your Dream Job. While I am looking into new career opportunities and have not yet found a new career path that is the right fit, I have used the techniques to research new positions and to better my standing in my current position. Check out his blog and his courses such as Earn 1K, how to launch a business and earn $1,000 in your first month, How To Find Your Dream Job, Zero to Launch, or Growth LabGrowth LabGrowth Lab. Even his free material will change the way you see your financial situation. His courses are priced at a premium – so I don’t recommend that you buy them until you are out of debt and have an emergency savings set aside and are in a stable position – but you don’t have to buy the courses to get benefit and value from his research. I love that he blocks people with credit card debt from buying his flagship courses. He encourages his readers to instead pay off their credit card debt, read his free material, and come back for the course when they are ready for it. And even if you don’t follow all of the steps in the program in order and step by step, I am confident that you get out of the course what you put into it. Tim Ferris has a long form podcast that can be very intense intellectually, which I love, although I sometimes I am like WTF – what are they talking about?! The first podcast I listened to was a very intense one about ketogenic diets. I encourage you to keep listening – even if you have no idea what they are talking about. Being a fly on the wall listening in to these conversations will open you up to a whole world of subjects that you may otherwise no nothing about. Tim interviews top world class experts teasing out their tips and tricks in his podcast and his newest books Tools of Titans and Tribe of Mentors. He has also written The Four Hour Work Week, The Four Hour Body, and The Four Hour Chef. I haven’t gotten to all of those books yet! So I can’t break those down for you, but I can assure you that they are on my radar and his podcast is played weekly if not daily. His daily rituals breakdown is fascinating to me and although I have not tested or experimented to nearly the level that he has with rituals, my interest is piqued and hope to run through the gamut of his guests’ responses as I go. Currently my morning rituals are inspired by Chalene Johnson and Tim Ferris. I wake, make my bed, exercise, make a cup of lemon and ginger tea, and write for thirty minutes. If I am lucky and it is nice out, I will walk my dog, then hurry to get ready and to work by 8 am. Truth be told, I am not that great at this routine at the moment. I often spend far too long hitting the snooze button for hours or scrolling mindlessly through facebook posts. But what I am aware of, through listening daily to top performer interviews on his podcast, is that daily rituals are indicators of having a successful day, so I continue to work on it. Being Boss – Emily and Kathleen are all about being boss and being apologetically yourself while earning a profit. Two boss ladies who feel like your best friends after listening to these two business besties rift off of and compliment each other’s work flow each week. This is another one that I began listening to because I loved the topics and the energy and passion that they have for their own side hustles and for the side hustle of others even though I had no intention of starting a business. Hearing them break it down and the enthusiasm for the process leaves me yearning for more creative and fulfilling work. I had heard the phrase passion project before, but the inspiration for starting your own passion project is magnetizing while listening to these two hand out their best actionable tips and tricks. And the downloads these two offer? Do yourself a favor and get on their newsletters ASAP. They are top notch and truly thought provoking, reaching deep into your psyche and pulling out your purpose in small actionable steps. Jenny Shih is my newest obsession. She’s a business coach who focuses on helping you get the results you want on your own terms. I love that she focuses on getting one on one clients in a busy world of courses and online programs. It’s a great way to get started connecting and engaging with clients, and gives you space to grow at your own pace – so that you can still have the freedoms that attracted you to your own business in the first place. What’s the point of freeing yourself from your 9-5 if all you are going to do is chain yourself to your desk and work at home? That’s not to say that you can’t have massive growth following her program. Quite the opposite. Jenny’s all about growing your business step by step without overwhelm and without hustling 24-7. I’ve been enrolled in the Make It Work Online workshop and prep school since November and her community of power house women are rock solid. She’s doing great things over there so if you are thinking of an online business be sure to check her out. Next week, I’ll be back to introduce you to a few more of my favorite mentors, that are a little less known for their financial and business mentor-ship, though, they often do have financial and business resources as well. Write down the 5 people you spend the most time with. Review the list and really think about if this is who you want to emulate and project into the world. If so, great! You can stop here. If not, Find one Virtual Mentor and really dive into their content. Only one at a time. Let it soak in, let their outer voice become your inner voice. Retrain your brain.